You are invited to watch the recording of GODAN Action webinar on Open Access & Open Data at PUSH Universities led by Anne Mims Adrian and Kara Newby from PUSH and the Hunger Solutions Institute at Auburn University, USA. PUSH (Presidents United to Solve Hunger) is a consortium of universities from around the world that have the collective mission to end hunger and poverty. Presidents who have signed the Presidents’ Commitment to Food and Nutrition Security have agreed to make food and nutrition security a priority on their campus. 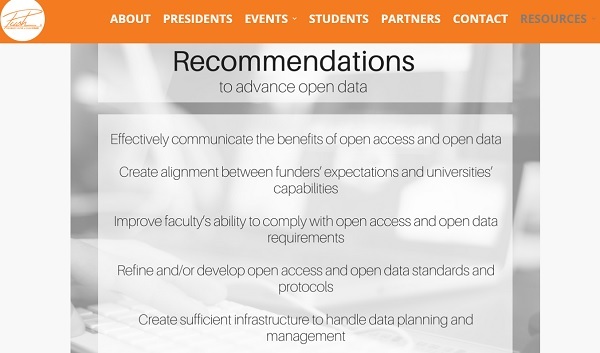 The REPORT entitled “Open Access & Open Data at PUSH Universities” (available here) was commissioned through GODAN partner Presidents United to Solve Hunger (PUSH). The report highlights the need for open access and open data at universities and its potential to enhance agriculture and nutritional research to help solve world hunger and malnutrition. Moreover, the report points out that open access and open data increase transparency, as well as citations and recognition of faculty and their universities. This increases the potential of identifying research collaborators and meeting funding requirements. A Global Open Data for Agriculture (GODAN) partner report "Open Access and Open Data at PUSH Universities", was published by Presidents United to Solve Hunger (PUSH), a GODAN partner led by Auburn University in the USA. GODAN, and Officials at Auburn, support university policies that permit access to university research in areas such as agriculture and nutrition. The report has highlighted the need for open access and open data that could be used to enhance research across the globe and help respond to global challenges such as hunger and malnutrition. The report is a result of an Auburn investigation of 99 PUSH member universities that found only 15 have open access policies, and that none have specific open data policies. The investigation also found the practice of open data is still largely driven by the research funder’s requirement to comply with their funding mandate. The privately funded Bill and Melinda Gates Foundation, for instance, requires all its funding recipients to provide open data. Martin Parr of GODAN says: “Researchers want to make the research they do more open to solve grand challenges in the world, but they want to do that in a way that does not jeopardize their careers. We need to work with them and the people who fund research to find new incentives for sharing to the benefit of all”. has its challenges as it is perceived by some that the release of intellectual property could financially benefit another academic institution before the data generators. It could also put additional demand on university librarians to manage enormous amounts of data. "We welcome this report by PUSH. We support the Open Data Initiative and believe Universities can do better in promoting open access and open data to help enhance research and innovation. ", - Professor Peter Atkinson, Lancaster University. Lancaster is one of two UK PUSH Universities. "Making data of this sort openly available creates enormous potential. It means there is a strong foundation for evidence-based policy-making, and a whole range of new opportunities for the development of innovative solutions to address pressing real-world problems" , - Stephen Pinfield, Professor of Information Services Management, University of Sheffield. GODAN supports the proactive sharing of open data to make information about agriculture and nutrition available, accessible and usable to deal with the urgent challenge of ensuring world food security. It is a rapidly growing group, currently with over 700 partners from national governments, non-governmental, international and private sector organisations that have committed to a joint Statement of Purpose. The initiative focuses on building high-level support among governments, policymakers, international organizations and business. GODAN promotes collaboration and cooperation among stakeholders in the sector to harness the growing volume of data generated by new technologies to solve long-standing problems and to benefit farmers and the health of consumers. The United Nations is a key supporter of GODAN’s mission, with the initiative working closely with the Food and Agriculture Organisation (FAO) and its Economic and Social Development Department, as well as a number of other UN affiliated organisations that advocate international development and open data. GODAN organised the largest-ever side event dedicated to open data in agriculture and nutrition, at the UN General Assembly, in New York in September 2016. Follow @AIMS_Community on Twitter... And, thanks again for your interest!